Interested both in creating a sort of farm-yard compound, as well as keeping the walls of the house open for windows, a detached garage was a natural choice for this project. The steep roof of the garage matches the house and provides the potential for creating a pottery studio somewhere other than the dark basement. A pergola visually connects the house and the garage — even though they are not attached to each other, they relate to each other in a deliberate way, and "belong" together. 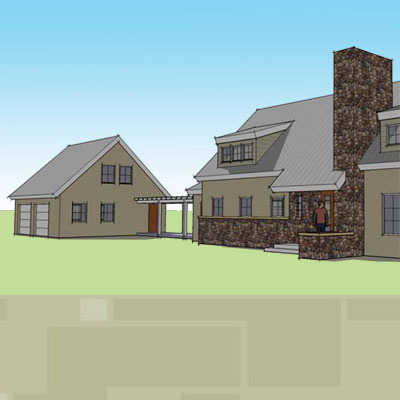 This version of the schematic design model shows shed dormers instead of the gable dormers shown in previous images. We also modeled here what the house would look like with the stone only wrapping around the east side as a cost-saving option. The latter part of the schematic design or early design development phase is the perfect time to explore the impact of these sorts of subtle changes.